I have come to the conclusion that my bread machine is evil. How can anything that is so easy to make and taste so good not be? I will bet you are thinking, its not so bad just eat it in moderation. 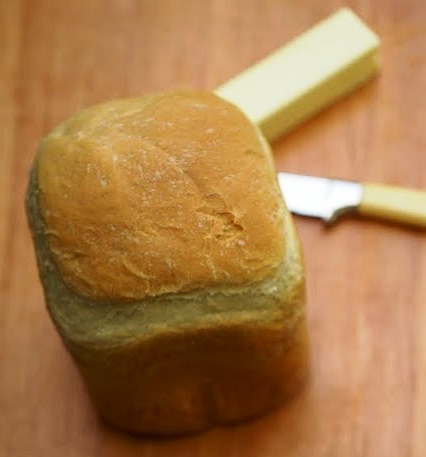 Have you ever ate hot homemade bread in moderation? It is like waving a Krispy Kreme donut in front of my face. You will be minus a couple of fingers. I got this bread machine from my mother in law. She had it for years. I think she realized how evil it was and decided to pawn it off on me. All is not lost I think to myself. I can still use this for good. I could make a loaf and give it to a friend in need. Yeah right, like that is going to happen. Pour the water into the bread pan. In a bowl combine flour, powdered milk, salt and sugar. Pour flour mixture over water covering it completely. Put the butter in separate corners of the pan. Make a small well in the middle and add the yeast. Insert pan into machine insuring it is locked into place. Close lid and set to basic or normal and select loaf size and crust type if applicable. When baking is finished, take the bread pan out of the machine and remove loaf onto a wire rack to cool. It is best to serve when still warm but room temperature is OK also. Hi! I’m make one time bread loaf but not come out perfect But i have to give this a try. Hahaha. That post was hilarious. Peace will need to be with me to hold me back from eating all the bread..LOL. I agree, Veronica, bread machines are evil! Those extra pounds on my hips are entirely due to my bread machine. Can’t resist once I get the scent of freshly baked bread. I think I shall banish the evil machine to the back of the cupboard… after I bake just one more loaf – this one perhaps! Have a great weekend. Can you believe I dont have a bread machine? A nice slice of thick white bread looks fantastic. bread and moderation are two terms that I do not believe go together! especially those that are made at home! Haha!! This post cracked me up! I love my bread machine, and while I use it probably weekly it’s mostly for doughs. This looks great though, will have to try it next time we run out of bread… haha! Great post! Love the bread. That evil mother in law of yours. How dare she to give you the gift of making your own fresh bread! You are just too funny. I don’t think anyone can resist a fresh baked loaf of bread. Great post, made me smile from ear to ear. Hi Veronica! I think my read machine is the evil one…it doesn’t make bread like that…it always rises too high and then falls during baking. Whoever programmed mine, knows NOTHING about making bread! yours looks lovely! I loved mine so much I now have 2. Lol! I have them both going quite often. Great for pizza dough and rolls too. Not good for the waist line but it’s fresh bread, who could want anything more. I the bread machine is evil you mist be one of it minions tempting me into purchasing one LOL.. I am torn between an ice cream machine and bread machine at the moment.. What to do what to do? I had a bread machine and gave it away..I think I’ll ask for it back! 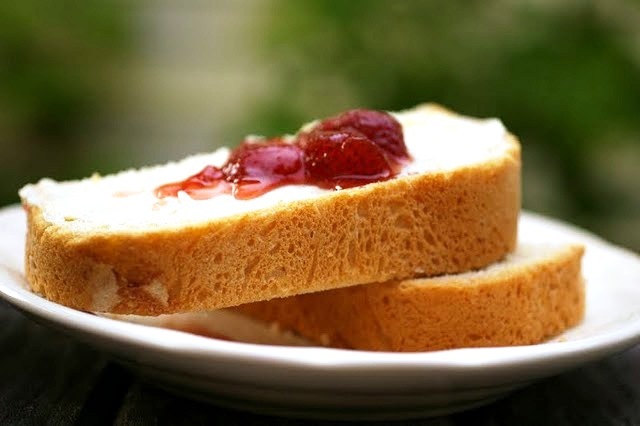 Yum there is nothing quiet like fresh bread, love this post, thanks, you’ve been buzzed! My niece got a bread machine and made bread every other day. Finally she had enough of the homemade bread addiction. I am sure it will come back though! I believe homemade bread is everyone’s comfort food and this loaf looks like a winner-yum! This bread is beautiful! I don’t have a bread machine, but I love making homemade bread – it just makes the house smell so amazing! Nothing better than freshly baked bread. Question – Do you use hot water or cold? My bread doesn’t seem to turn out right so I haven’t tried it in a while. I think it may be because of the water temperature, but I’m not sure. Also, I think I put my ingredients in the machine in a different order, so I’m going to try it this way and see if that helps. I love homemade bread and I’ve almost resorted to the old fashioned way of making it just to have it! Great post! 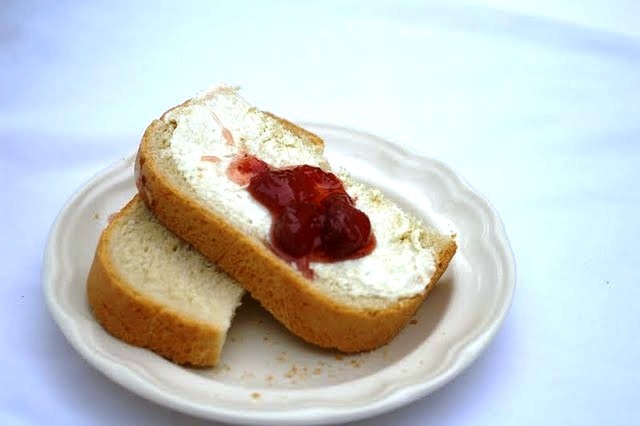 Loved your photos and thoughts — homemade bread truly is manna from heaven. “Hi” from The Culinary Lens “Thinker” party!